Hankook Golf Tournament was organized last Friday 18th March 2016 at the Sahara Golf Club. It was the 11th successive year of this prestigious event, which is usually organized in the month of March each year at the beginning of the spring season. 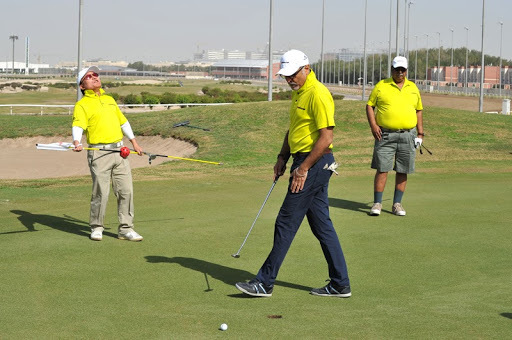 Since it is an open event with participation not just limited to Sahara Club members, the tournament has always attracted golf enthusiasts from all over. This year as well, there was an overwhelming rush for inclusion, and after extensive deliberations eventually 104 players were shortlisted covering various nationalities, age-groups and diverse backgrounds. The weather was quite pleasant on the day with a light, cool breeze blowing. The verdant,beautifully-landscaped 18-hole course of the Sahara Club together with ambient climatic conditions contributed to a healthy game of golf. The game was played in the ‘Stableford’ format as usual, which allows for relatively speedy play. The tee-off commenced at 8:00 am using the Shotgun approach, and the players were able to finish their games by around 1:00 pm. Young Soon Son came up with an astounding performance to win the tournament with a net score of 39 points. He was closely followed by Wahab Al-Rashoudand JeongIl Suh both on 38 points, but on countback, Wahab was declared secondandJeongthird. The coveted trophy for Best Gross was won by the young budding talent Ali Al-Ansari, who comes from a family of keen golfers. Not only did he come up with a superlative gross score of 71 points, but also hit the ball a breath-taking 350 yards so as to win the prize for Longest Drive – Men’s. Among other prizes, the trophy for Longest Drive – Ladies’ was won by Park Soon Yi. The prizes for Nearest to Pin were won by the FadiaEmadi Al-Welayti and the veteran Brian McDonald in Ladies’ and Men’s groups respectively. Incidentally, Fadiahas won prizes in the same category in recent tournaments. Prize distribution was organized in the afternoon in the gracious presence of MishariAlMailem and B.H.Kim General Manager,Hankook. Speaking on the occasion,ChojiLamba, President, AlMailem Group expressed his satisfaction at the enthusiastic response. “It is wonderful to see so much energy and excitement among golfers here”, adding, “I would like to express our gratitude to Hankookfor their unwavering support”.Finally, he complimented Razmic, Edward, Richard and other Sahara Club officials for their professional administration of the event. It is expected that the tournament would continue to receive the same level of support from the golfing community in future also.